What went wrong after Oslo? Deutsch - Israelischer Arbeitskreis für Frieden im Nahen Osten e.V. on the Right is Dr. Zakaria al-Qaq, Palestinian Co-Director. And lots of other reasons that will be researched and written about. I would like to attempt to write about some of the underlying reasons, some of the events that were not directly in the public eye or were missed as important and significant as they were happening. Many of the points written here I have included in the form of policy documents and recommendations/warnings to the various governments of Israel, the Palestinian Authority, the negotiators, the US sponsors and other important players. This is an attempt to summarize those events with some order and reason. Where to start is a difficult question. One could say that the Oslo Agreements were flawed from the outset and there are many good reasons to point out the flaws. In hope that others will do that, I will skip that part of the analysis. Despite the flaws, I for one supported the agreements and thought that people who truly want/ed peace in the region have an obligation to support whatever agreements are/were reached by the sides. From the outset I will also put on record that I have always been doubtful about the ability of Israel to reach a full peace agreement with Yasser Arafat. These doubts have significantly increased over the years. the refusal of Israel, the United States, and the Palestinian people themselves to demand from Arafat the kind of democratic regime that I believe is necessary to bring about real peace. Israel and the United States are/were afraid of too much Palestinian democracy out of fear that through this democracy anti-peace forces such as Hamas would increase their power. They are/were afraid of what I call the "Algeria syndrome". These fears might be well placed, however, in my view, the absence of democracy is one of the main underlying roots of the Palestinian intifada. It should also be noted that the various governments of Israel viewed Arafatís ability to take actions against anti-peace forces in Palestine as overriding any need for Palestinian democracy. This was summarized by Rabinís famous sentence ? "bli bagatz uíbli btzelem" ? without the Supreme Court and with Betzelem ? meaning that Arafat could arrest, detain, and even execute anyone, without any real due process of law. Israel was/is also afraid of the Palestinian Legislative Council being able to legislate Palestinian laws that are against Israelís interest or against agreements so that Israel never challenged Arafat when he declared in private meetings that he could not sign the "Palestinian Basic Law" ? the Palestinian Constitution - into law because of Israeli objections. This Constitution would have given some real basis to the rule of law in Palestine and would have created some semblance of the separation of authorities and some measures of checks and balances. I myself appealed to Rabin, Peres and Netanyahu to issue public declarations that Israel viewed the "Palestinian Basic Law" favorably ? something that never happened. We must also take note of the wide ranging Israeli involvement in the development of the centrally controlled, monopolistic and corrupt Palestinian economic system. Despite constant warnings by this author and many others of the dangers of direct Israeli involvement in Palestinian corruption, Israeli officials facilitated and encouraged what must be called "the ripping off of the Palestinian people" through shady deals and schemes conducted in broad day light by tens of former Israeli security officials with agents of the Palestinian Authority including Palestinian intelligence officers, policemen and "advisors" working on behalf of themselves and on behalf of Arafat directly. Many of these deals, if conducted in Israel proper would have ended with indictments and jail penalties. But in this case, they were conducted in "the interest of peace". This is perhaps one of the most cynical elements of what has emerged over the past eight years. Perhaps even more cynical is that much of that cooperation is continuing today and it should not surprise anyone that the first order of Palestinian-Israeli business under Sharon has been the opening of the Casino in Jericho. Who will follow after Arafat? With all of that preface I will begin my analysis on some of the other underlying causes and ailments of the peace process beginning with September 1997. In mid September 1997 during the time of Prime Minister Netanyahu, Yasser Arafat gave an extended interview to Israeli Channel Two News. That interview which lasted about 20 minutes was conducted in its entirety in "close-up". It was striking how ill Arafat appeared. The camera focused on his quivering lower lip and his shaking hands. The local and international media was filled for weeks with guesses about what Arafat was suffering from, what medications he was taking, how the illness and medications effected his performance (or lack of) and how long he lad left to live. All of a sudden everyone was asking what would happen in the post-Arafat era and who would take his place. I myself was interviewed more than 40 times by journalists from all over the world on these questions. But more important than the questions of the journalists were the questions being asked by Palestinians themselves. Since the creation of the Palestinian Authority the main concern on many Palestiniansí minds seemed to be how to get a piece of the cake. Many of the former activists who led the first intifada sought to participate in the Authority, each in his own way, by getting senior positions in Ministries and in the security forces. Many of the local West Bank and Gaza personalities were quickly dismayed as they saw the "Tunisians" - those who came with Arafat from abroad, getting the top positions, the senior officers, the Ministers, while they were being given second or third chair in the orchestra that they thought they had created. More importantly, political "party" life ? that had been the basis of the first intifada through the unified leadership consisting of representation from the main PLO factions, all but ceased to exist. The ideology of the Palestinian resistance and liberation movement seem to fizzle away with shortsighted short-term private interests taking priority. One Palestinian intellectual and former Fatah activist described it as follows: "For me Palestine today ends at my door-step". The impact of that kind of thinking was the demise of the political parties - the PFLP, DFLP, Fida, PPP and foremost - Fatah. At that point, a decision was taken to revive Fatah through grass-roots activities and by taking a militant stand on central issues in the peace process - settlements, refugees and the first order of business - prisoner release. It is important to note that in September 1996 these Fatah leaders led the first days of violent demonstrations against the opening of the Kotel tunnel by Netanyahu. The success of those riots from their perspective in gaining Palestinian public support was a signal for them that the model of armed resistance against Israel was not removed as a real option for future confrontations. Thus a strategic decision was then taken to reconstitute the Fatah Tanzim (a military wing of the Fatah organization, J. Gruber), which had been first established in 1983.
releasing all Palestinian prisoners from Israeli jails. In April 1998 a major article appeared in an important Arab journal in Beirut analyzing the process of selecting a new Palestinian leader after Arafat. This was the first of many similar articles that appeared throughout the Arab world and the subject became the most widely discussed in the mass media such as the popular Al Jazeera cable television news program from Qatar. In the lead up to the Wye River agreement in October 1998, Arafat declared a series of political actions throughout the Palestinian territories under the title "Days of Rage" in which Palestinians were instructed to demonstrate and march against Israeli settlements. All of these events, including the protests led by Faisel Husseini against Har Homa - Jabel Abu Ghain were failures. The people simply did not come. Arafat resorted to closing the Ministries and ordering all PA workers and their families to board buses to protest. In Jerusalem, it was even reported that people were paid to attend the demonstrations against Har Homa. Palestinian Leadership - Fatah Against "The Tunis People"
Many might draw the wrong conclusion that the Palestinian public was apathetic - they were not. They simply did not wish to answer Arafat calls out of frustration, shame and despair of what was becoming of their Palestinian dream. In a mass meeting held in Nablus prior to the Wye Agreement, a senior Palestinian security official that had come from Tunis called upon the people to "go to the streets and fight the occupation". One angry Nabulsi stood up and said: "We did our share during the intifada, we sacrificed our children and our lives. Now itís your turn to send your children." Everyone in the room knew that the children of the Palestinian security chief were all living and studying abroad. While this was happening the Fatah Tanzim began a process of democratic elections of new cadres of leaders throughout the West Bank and less so in Gaza where Arafatís Palestinian Security Forces had more influence and control. In every village, town, city and refugee camp Fatah was organizing. Soon they launched their very successful public campaign that they called the "prisoners intifada" with marches throughout the territories gaining wide public support. Fatah Tanzim was also amassing weapons throughout the land. Between 1996 and 1999 Fatah held more than 122 conferences in the West Bank alone with more than 85,000 people taking part. The stated aim at these conferences was to convene and elect a new Fatah Central Council and a new Revolutionary Council. These groups had not met in more than 11 years. At Wye River Israel, under Netanyahu, with firm American political and CIA support pressured Arafat to disarm all of the militia in the West Bank, particularly the Fatah Tanzim. The Wye River Accord was signed on October 23, 1998. On October 25, 1998 the forces of Colonel Musa Arafat, the head of the Palestinian Military Intelligence Forces (and Arafatís nephew) forcibly entered the Fatah Tanzim office in Ramallah. Fatah Tanzim resisted and a shoot out in the middle of Ramallah erupted. In the end, a young Palestinian, Wassim Tarifi (a nephew of PA Minister Jamil Tarifi) was killed. Downtown Ramallah was closed for several days during which time a standoff developed between the Tanzim and Musa Arafat and his troops. In the end, Arafat ordered Musa Arafat to withdraw. The Tanzim won their first strategic battle in the fight for Palestinian leadership. It was reported that following this incident the walls of Ramallah were filled with graffiti denouncing the "filthy collaborators of the Military Intelligence". Three weeks later rioters in Balata refugee camp tanzim activists stormed the local PA Police headquarters in the camp, set it on fire, burned a police car and then only withdrew after being fired on by Palestinian police. The riot started after PA Police prevented demonstrators from marching on Josephís Tomb during the "Prisoners Intifada". In May 2000 after completing the process of elections throughout the territories, the Fatah Tanzim decided that the time had come to take the struggle to the streets. The final status negotiations with Israel did not begin. Prime Minister Barak was not taking the Palestinian issue seriously in their view, preferring to seek an agreement with Assad as a way a weakening the Palestinians. Barak, insisting that it be part of the final status agreement, did not accept the third redeployment. And Palestinian prisoners were not being released; the committee dealing with the matter simply dragged its feet as Israel spoke about not being able to release prisoners with blood on their hands. In a closed meeting organized by IPCRI in April 2000 between Israel MKís from the coalitions and high ranking Tanzim members, Marwan Barghouthi stated: "I feel ashamed that more than 500 prisoners -- some of whom killed Israelis -- are still in Israeli jails. Before Oslo there was the Intifada and there was fighting between the two sides, between the PLO and Israel. Barak, who is now your Prime Minister -- and we met with him personally -- killed three leaders in Lebanon. But we sit down with Barak now because we have to start a new history between the two peoples." On May 15-17, 2000 the Palestinian territories once again erupted in fire for three days of mass Palestinian demonstrations marking "Yom al Naqba", the day of tragedy. This was not the first time that the Palestinians marked this day, but never before had hundred of thousands of them taken to the streets. Armed attacks took place at some of the major Israeli-Palestinian junctions in the West Bank and Gaza. The joint patrols, initiated to take action during times like this ceased to work. The demonstrations and the military actions were all led by the Tanzim. It took Arafat three days before he was able to control the situation on the ground after grinding pressure from Israel and the Americans. After the three days, Marwan Barghouthi stated: "We used weapons against Israel and if we have to we will use them again in the future". According to my analysis, at this time Arafat made a strategic decision to keep the Fatah Tanzim alongside of him. According to Arafatís thinking, if he reached an agreement with Israel he would need the power of the Tanzim to carry the street and if he didnít reach an agreement with Israel, he would need the Tanzim to lead the resistance. Shortly after the May 15-17 events, Arafat arranged a reconciliation meeting between the Tanzim and West Bank Preventive Security Chief Jabril Rajoub whoís relations had been strained about a year before when the Tanzim accused Rajoub of turning over several Palestinian prisoners to Israel after Israel demanded their extradition. Barak's Offer in Camp David. Arafat's Demands in Camp David. Mr. Barak claimed that he would receive the support of the majority of settlers because 80% would remain where they are and would be under Israel sovereignty. Only some 40,000 settlers would have to relocate into the so-called "settlement blocs" that would be annexed. Yet the Palestinian rejection was swift and firm and in fact, served as one of the primary motivating forces that led to the intensity of the "al-Aqsa intifada"
Since most Israeli and foreign opinion views the rejection of the Palestinians as a foolish mistake we need to take a closer look at its causes Palestinians who were at Camp David spoke about a new concept in the Israeli-Palestinian lexicon that was born "up on the hill" in Camp David with the help of planners and map experts brought in to interpret the positions and problems presented by both sides. choice: refugee life has been characterized by an absence of choice. Barak's Offer from: Erinnerungen an die Konferenz von Taba). Israel never presented a map to the Palestinians or to the Americans. Each side at Camp David worked with their own maps and kept them to themselves. The new concept was: settlement clusters. "settlement clusters" refers to groups of more isolated settlements in the heart of the Palestinian territories becoming islands of Israeli sovereignty once annexed by Israel. The Israeli 89% - 11% offer to the Palestinians included a number of these settlement clusters. This reality also meant that about 40 Palestinian villages with about 80,000 Palestinians would also be annexed to Israel. The Palestinianís top urban planner was rushed to Camp David by Arafat to interpret the Israeli offer that the Americans were pressuring the Palestinians to accept. The Americans and the Israelis told the Palestinians that this was the best possible offer and that Barak had done the maximum. Barak, they explained, would have to withdraw more than 40 settlements and more than 40,000 settlers. Any additional compromise would bring down his government and then "Arafat can negotiate with Sharon and Bibi" Barak said. They would not have control and sovereignty on main arteries of transportation. The Jordan Valley would still be controlled by the IDF, even if the Palestinians were granted some kind of control there. however, it was not clear whether Barak was willing to "allow" the Palestinians to have a sovereign border crossing with Egypt in Rafah. (After Camp David it became less clear whether in fact Barak had actually offered to remove all of the Gaza settlements, where they still control about 30% of the Gaza Strip). Throughout the negotiations the Palestinians constantly reminded themselves, the Americans and the Israelis that according to Oslo II, the agreement signed in Washington in September 1995, Israel was supposed to implement further redeployment of its forces (and control) to "specified military locations". The mutual Israeli-Palestinian understanding of this at that time included the Israeli settlements within the definition of "specified military locations". According to the Palestinians, by the end of the interim period (5 years) Israel should have withdrawn from 90% of the West Bank, based on a signed and endorsed agreement. The Palestinians believed that the area of the settlements included only the built up areas, allowing for a perimeter of 50 meters from the last home in each settlement (something that Netanyahu agreed to at Wye River regarding future settlement expansions). This together with IDF bases would amount to about 10% of the West Bank. When Benyamin Netanyahu was Prime Minister Israel claimed that the agreement referred to "security zones" and not "specified military locations", a much broader definition allowing Israel to decide unilaterally that the further redeployments would be much less than the Palestinian demands. Netanyahuís office produced a Hebrew version of the Oslo Agreement talking about "azorim bitchoniim", security zones. At the same time, the Israeli Foreign Ministry produced an internal document labeled "Secret, Limited Distribution" with the correct translation of the term "specified military locations" claiming that the Palestinian interpretation was the correct version. Mr. Barak decided even before being elected that he would "merge" the third further redeployment with the final status agreement and thereby avoiding the need to make "unnecessary concessions" to the Palestinians. In other words: there would be no further redeployment (the Palestinians had expected to include at least 50% of the West Bank). The Palestinians have claimed since Oslo in 1993 that they had made their "historic compromise" by giving up 78% of Palestine, leaving them with only the West Bank, East Jerusalem and Gaza. They believed that Israel would make its "historic compromise" in the final status negotiations when they withdraw from 100% of the West Bank, East Jerusalem and Gaza, allowing for minor border rectification and taking into account some of the new realities on the ground. Taking into account some of the "new realities" led Arafat to offer Barak 2% of the West Bank "for free" and another 2% in exchange for territory of equal size and quality inside of Israel. (This was the Palestinian counter offer at Camp David that no one speaks about). The Palestiniansí position has been based on their demand to implement UN Security Council Resolution 242 (according to their understanding) meaning a full Israeli withdrawal from all territories conquered in 1967. Arafatís agreement to give up 2% "for free" led to a deep rift within the Palestinian delegation. Unofficial reports even spoke of a "fist fight" that broke out between at least 2 of the delegates from the Palestinian team. The intensity of dissatisfaction within the Palestinian delegation should have been taken as a signal by Israel and the Americans that the Palestinian public would "explode" at the notion of having to "take it or leave it" with regard to the Israeli "generous" offer. In public opinion surveys conducted amongst Palestinian following Camp David it was found that the highest level of dissatisfaction and anger by the Palestinian public was demonstrated with regard to the territorial issue and the settlement issue. The Palestinians saw the rapid expansion of settlements and roads during the past 17 months of the Barak government, 30% more than what Netanyahu built. the idea of Palestinian independence and statehood becomes little more than a farce. The Israeli peace camp always objected to the building of settlements. From the very beginning of the settlement movement the peace camp in Israel was out on the streets protesting. I remember tens of those demonstrations - the most dramatic of them for me being the demonstration in Efrat in 1982 on a cold rainy Saturday before the first person had even moved in. The reality of the amount of money, roads, infrastructure and houses built was impossible to ignore. I remember saying "weíre carrying signs and theyíre building" - what a feeling of impotence! Throughout the negotiations over the years, most Israelis have claimed the irrelevance of international law expressed so eloquently by Ben-Gurion "Um - schmoom" - meaning "UN - nonsense!". Who cares that the "progressive" Supreme Court of Israel has consistently rejected the notion that it must consider international law - Its mandate is only within the framework of Israeli jurisprudence. It now appears after a total breakdown and perhaps permanent collapse of the Oslo Process that the slogan "settlements means no peace" is a reality. It seems almost impossible to imagine any Israeli government willing to remove more settlements than Barak offered. The Palestinians are dissatisfied with the hegemony of the US as the sole legitimate mediator. The desire to demand international intervention, protection and even mediation is not tactical - it is strategic. They know that international law is on their side. It seems that their strategy also includes a Hizballah type of war of attrition on specific isolated Israeli settlements in order to demonstrate their high cost to Israeli interests. It is not by chance that Netzerim, Kfar Darom, Psgaot, Kadim and Ganim have become targets during this new intifada. It should also be noted that during the entire course of the 15 days of Camp David negotiations, Barak and Arafat only spoke to each other directly twice, for a total of less than one hour. Amazingly those discussions focused only on the food and the weather at Camp David. Clinton had decided after Netanyahu and Arafat denied what they had agreed upon in private talks at Wye, that Americans insist US note-takers to be present at every Israeli-Palestinian meeting at Camp David. Barak, who went to Camp David with the attitude that "all Israeli proposals are hypothetical until all are agreed upon", refused to be "trapped" (in his words) by American texts. Therefore, Barak refused to negotiate directly with Arafat. From the American point of view, members of the US Peace Team were bewildered by what they saw as the tragic outcome of Camp David almost from the beginning but were unable to influence Clinton who had staked his entire Presidency on his Middle East diplomacy. Camp David was not prepared correctly by any of the sides, yet the ticking time clock of Clintonís Presidency forced the process forward. Then came September 28, 2000. Arik Sharon in a direct provocation to talks in Israel about relinquishing Israeli sovereignty over the Temple Mount demanded the right to visit there. Barak, feeling pressured by the public outcry against his intention to turn the most Holy Place for Jews over to the Palestinians consented to Sharonís request. There are conflicting stories whether Jabril Rajoub said that the visit would be all right if Sharon did not enter the mosques or whether he warned that in any event it would lead to an explosion. In light of the decision to convene the summit in Camp David next week, I would like to share with you some of my observations and assessments following the intensive dialogue we have been conducting with senior officials from Israel and the Palestinian Authority about the future of Jerusalem. We believe that these observations and assessments are crucial in the attempt to reach an agreement about the future of Jerusalem. The Palestinians feel significantly strengthened in their positions of principle following the Israeli-Syrian negotiations and following the Israeli withdrawal to the international border with Lebanon. The most important of these principles is sticking steadfastly to UNSC Resolution 242, which they insist applies to the West Bank and Gaza equally to its application with Israelís other neighbors. They are convinced and have international legal opinions that support them firmly. They will stick to this position without bending even 1mm. This is a position of principle and will serve as their compass for all negotiations and agreements. With regard to Jerusalem it is essential to understand that for the Palestinians Jerusalem - Al Quds is the Old City. Abu Dis, Shuafat, Beit Hanina, etc. are not Jerusalem and cannot be in place of Jerusalem. The Palestinians are firmer on this issue than on any we have ever seen. The Palestinian position has significantly hardened in the past six months. The Palestinians demand and will continue to demand throughout the negotiations, a return to the 1967 borders in Jerusalem. They will hold on to the position that all of East Jerusalem must be under Palestinian sovereignty. They will argue their case through international law, UN decisions, and the general international position that Israel has no legal rights to East Jerusalem. In my view, the Palestinians will not compromise on this issue at all. At best they might agree that there be no declared sovereign over the Haram el Sharif/Temple Mount - not Israel and not the Palestinians as long as they have effective control over the Haram el Sharif/Temple Mount. If the Palestinians do gain sovereignty over East Jerusalem, they will, under pressure, agree as a sovereign, to relinquish sovereignty over the Israeli neighborhoods in East Jerusalem (within the municipal boundaries), over the Jewish Quarter of the Old City and over the Kotel. To quote one of our senior participants, the Palestinian State has no interest or desire to rule over 180,000 Israeli in Jerusalem. The relinquishment of Palestinian sovereignty over parts of Jerusalem is only "salable" to them once reminded over and over again that this is a sovereign right and not something that they are being forced or coerced to do. There might be an Israeli decision that the price of the agreement is too high. There might be a belief on the Israeli side that the Palestinians will "cave in" under pressure, in our view, they will not and the chances for violent confrontation will increase significantly as result of increased Palestinian frustration. Arafat has received additional support from all quarters of the Palestinian society to hold firm. He will weigh heavily on the Americans to support his position of principles and he will paint Israel as the primary violator of the already signed agreements. He will raise the issue of Israeli non-compliance with the redeployments as a main example of not honoring agreements. In our assessment, the only way to reach an agreement on Jerusalem with the Palestinians is to go far beyond what the Israeli position has ever been. Without this, there will be no final status agreement and no Palestinian agreement to end the conflict and the demands from Israel. Postponement of the decision on Jerusalem will necessarily mean that there will not be an "end to the conflict" agreement. It is essential to understand this point. Shortly before Camp David the Israeli media reported that the Chief Rabbinate was instructed to re-examine the Halacha or Jewish religious law on the question of Jewish prayer on the Temple Mount. It was further reported that this reexamination would include the possibility of constructing an area for Jewish prayer somewhere on the Temple Mount. 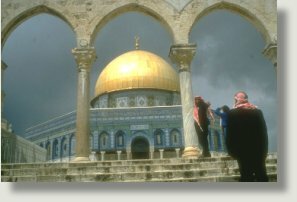 As the Israeli press had been publishing full of reports about Palestinian construction and excavations on the Temple Mount doing irreparable damage to Jewish historical evidence of the Holy Temple, the Palestinian and Arab media was full of stories of Israeli tunneling beneath Al Aqsa and Israeli plans to capture Al Aqsa and divide it into Jewish and Muslim prayer areas like the Cave of the Patriarchs in Hebron (The Ibrahamia Mosque). Several days before the Sharon visit to the Temple Mount, the Islamic Movement in Israel held a conference attended by 70,000 people (as reported) in Um el Fahm under the title "Al Aqsa is in Danger". Sharon, who intended to weaken Barak in the eyes of the Israeli public never, intended his visit to provoke the response that it did in Palestine. What Triggered the Al-Aqsa Intifada? I believe that the launching of the intifada was neither planned or strategically thought of by the Palestinian leadership - be it the PA or the Tanzim. It was a series of events that developed rapidly, escalated and got out of control. Decisions regarding its continuation and its course were made mostly following the events themselves. This is how I see it unfolded. The Sharon visit with hundreds of security personnel on Thursday September 28th ended almost without incident on the Temple Mount, however in riots in the West Bank five Palestinians were killed and more than 300 wounded. There were only about 2,000 Muslim worshipers on the Mount at the time of the visit. There was some stone throwing after Sharon has already left. On Friday September 29th the Palestinian leadership called for demonstrations all over the territories and in particular on the Haram al Sharif. At the end of Friday prayers some 50,000 worshippers faced battalions of the Israeli police and Border Guards who came to maintain public order. One of the first stones thrown hit Jerusalem police commander Yair Yitzhaki directly on the head. He was removed from the Mount on a stretcher having suffered a bloody concussion. I spoke to one of the officers who was there, several days later, he told me that when the police saw their commander removed from the Mount with what looked to be a serious head wound, they lost control. No one was in charge and live ammunition was used to disperse the rioters. Four Palestinians were immediately killed on the Mount and another two in the Old City and four more in Gaza with a total of more than 700 wounded. On Saturday October 1, Israel was celebrating Rosh Hashana - the Jewish New Year, another 10 Palestinians were killed and more than five hundred wounded. Also on Saturday, Palestinian citizens of Israel joined in the rioting and main thoroughfares throughout the country were cut off including most of the roads in the West Bank, in Wadi Ara and in the Galilee. The country was under siege and people on both sides were very angry. By Sunday October 2, Palestinians were burying 33 dead compatriots. The situation was completely out of control. Well into the first day of riots the Fatah Tanzim pulled out their arms and opened fire on Israeli targets in the West Bank and Gaza. Arafatís regular police were not directly participating in the fire, but they were also not stopping it. The Tanzim managed to pull masses out on to the streets particularly as they came out to participate in the funerals all over the territories. Inside of Israel what started as demonstrations against what people perceived to be Israeli plans on the Haram al Sharif swiftly turned into complete civil unrest in response to the brutal force used by the Israeli police against Palestinian citizens of the State. On Sunday night IPCRI organized a meeting in Ramallah with West Bank Preventive Security Chief Jabril Rajoub and two MKís from Meretz - Avshalom (Abu) Vilan and Mosy Raz. Abu Vilan had served as an officer under Barak in the elite unit and despite his membership in Meretz maintained a very close relationship and friendship with Barak. In preparation for the meeting Vilan spoke with Barak who conveyed a message for Arafat. 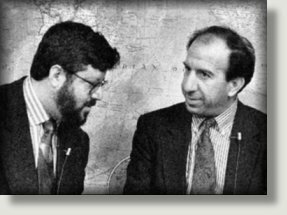 Until that point there had been no direct contact between Barak and Arafat from the beginning of the intifada. Rajoub called Arafat and delivered Barakís message: Netzarim and Josephís Tomb are yours in negotiations, but if we are shot at we will defend those places and all others. Vilan called Barak who was at his home in Cochav Yair. Barak responded that he was having the information cross-checked from another source. Fifteen minutes later Barakís military attaché confirmed that they had received the same information from another source. Arafat, through Rajoub suggested that he and Barak meet that evening to work out the details. Barak requested some more time. Jabril Rajoub instructed his people to prepare for a meeting in his office between Barak and Arafat. Arafat was in Ramallah. After half an hour, Barakís military attaché informed Vilan that another channel of communication had opened and that Barak preferred that channel. The other channel was Yossi Ginosar, former deputy director of the GSS, emissary of Rabin and Barak to Arafat and business partner to Arafatís chief businessman, Mohammad Rachid. About fifteen minutes later Barakís military attaché informed Vilan that Barak would agree to conditions 1-5 and that 6 was out of the question. He further informed Vilan that he would not agree to see Arafat that evening. We were escorted out of Ramallah by Rajoub himself and his troops. Later that evening a meeting took place between Ginosar and Arafat that was a catastrophe and ended up as a screaming match between the two. By the end of October there were already 134 Palestinians killed and over 7000 wounded. The Israeli casualties also began to build up. Three Palestinian doctors and one German doctor were killed. Ninety-one paramedics and 71 journalists were also injured. The number of disabled, as a result of Israeli attacks, reached 2200 Palestinians compared to 2525 Palestinians during the first Intifada in 1987-1992. The Palestinian economy suffered losses estimated at $4.4 billion US dollars. The GNP plummeted 50.7% during the last seven months. The Palestinian agricultural sector lost $217,905,509 US dollars by 31 March 2001. About 30,000 Palestinian farmers suffered huge losses. dredged 42,000 dunums (10 dunams = 1 acre) of land mostly in the Gaza Strip. The dredged sites represent 11% of the total area of the Strip of 367 square kilometers. Israeli authorities confiscated 2617 dunums of land for expanding Israeli colonies or to pave by-pass roads for use by Israeli settlers. 0% of them were children under the age of 18. Forty-one schools were ordered closed, 65 students and 15 teachers were arrested. Israeli military operations displaced 4000 Palestinian families. The average Palestinian family consists of 10 members in Gaza Strip compared to 6 in the West Bank. Israeli occupation authorities dismembered the Palestinian Territories into small sections dividing the West Bank into 64 sectors and the Gaza Strip into three. These divisions separated Palestinian cities, towns and villages into isolated easy to control cantons totally restraining the movement of Palestinian civilians. Israeli forces setup 145 new roadblocks with 103 in the West Bank and 42 checkpoints in the Gaza Strip. These measures were used to inflict further humiliation on the Palestinian people. Israeli forces closed off all highways, main and secondary roads including farm and dirt roads. Palestinians had to use dangerous mountainous trails to by-pass Israeli blockades. Today, it would take a Palestinian triple the time to travel between two points than what it took in normal circumstances. hundreds of wounded since September 28, 2000. Israelis are subjected to living in fear of random terror. The firm position of the new Government of Israel headed by Sharon is clear : there will be no negotiations with the Palestinians until all of the violence ends. Arafatís position is equally clear - he will not even attempt to stop the violence without some kind of political gain that he can present to his people who have suffered so many losses. Sharon has said that he is not interested in a final status agreement; rather he is talking about a long-term interim agreement that could consist of some 42% of the West Bank and limited Palestinian statehood. Initially it seemed that the intifada would provide political benefits to Arafat. The Israeli positions from Camp David did move significantly in favor of the Palestinians by the conclusion of the Taba talks, just days before the Israeli election. But by then it was too late and Barakís bet on elections caved in on him and on the peace process. In my view Arafatís critical error occurred around the fourth day of the intifada. Had he taken control then and put and swift end to the resistance and the violence, he would have returned to the negotiating table as a brave leader. The Israelis and Americans would have understood the great dissatisfaction with the Israeli "generous offer". It would have been before the horrific lynch of the reservist soldiers who drove into a Palestinian checkpoint by error and ended up brutalized to death by a wild angry mob in Ramallah. It might have been possible to reach understandings and agreements on almost all of the issues. In any event the peace process would have continued with a lot more empathy and support for Palestinian positions. Barakís great error was that he did not allow Arafat to have a week without funerals. Each and every funeral spilled oil on the burning fire of Palestinian anger. Barak was under attack in Israel. In the public eye he was weak and inconsistent. He felt that as a military leader - Mr. Security - he had to show Israelís force and his willingness to deploy it. Barakís use of the full wrath of the Israeli army encouraged Palestinian society to fully adopt and support the continuation of the violence against Israel. Shimon Peres who's unending attempts to reach a breakthrough will most likely not work. Peres put his cards on providing the Palestinians with economic benefits. Once again, Peres totally fails to understand that the Palestinian people are fully behind the struggle and have no faith in negotiations with Israel and even less faith in Shimon Peres. Palestinians understand that just as easily as Israel increases the number of work permits it provides for Palestinians it can impose closures and sieges and end any new economic opportunities. Building bridges and railroads between the West Bank and Gaza will also not buy any Palestinian votes in favor of Peresís initiatives. Nothing short of these two issues will lead Arafat to take any steps at stopping the fighting. Even if this agenda is accepted by Israel, which at this point seems very unlikely, there is no chance that future negotiations with Arafat and Sharon at the helm will produce any fruit. Furthermore, according to many reports, including from the Consulate General of the United States in Jerusalem, there are more than 10,000 empty flats in the settlements already. There are many settlements, particularly in isolated areas, in Gaza, the Jordan Valley and in the "heartland" of the West Bank where the social fabric of these settlements are beginning to wither due to the difficult conditions that the settlers face as a result of the intifada. It is being reported on almost a daily basis that many settlers are registering their children in schools within the "green line" for next year - a clear indication that those settlers will be leaving. There is no doubt that if opportunities were available for settlers to receive alternative housing inside of Israel many would leave on their own. It is important to point out that despite the difficult situation, more than 50% of Israelis still have little sympathy for the settlements. The figures are even high with regard to settlements in Gaza. The beginning of the peace process after the Madrid Conference in 1991 addressed an initiative that was called "Gaza First". The Israeli peace camp can once again adopt this platform. This time "Gaza First" should refer to the removal of all of the Israeli settlements from Gaza - first. It would be advisable to make clear that this would occur as part of an understanding with the Palestinians that the resistance and the intifada must end first in Gaza. International efforts should adopt this platform as well. The EU and it member States should call on Israel to withdraw completely from Gaza. International mediators should try to work out understandings between the sides. This kind of platform could help to reconstitute the Israeli peace camp and its supporters around the world. No sane Israeli is interested in the continued occupation of 30% of the Gaza Strip and the need to protect the fanatic settlers who force Israel to continue its occupation there. Political Change - What Next? Who is in control in Palestine? These questions are argued about daily by the various intelligence branches of the Israeli security forces. My own assessment is that Arafat is not in control at the tactical level. But while he is not instructing or ordering, he maintains overall control. He has fostered an environment that encourages attacking Israel. The Palestinian Authority has basically ceased to function as a government providing services, but the Palestinian security apparatuses are fully functioning and under the direct control of Arafat. In my assessment, if Arafat wanted to take back control, he could. It would not be with the push of a button, but he remains in power. It must be understood that until there is political change on both sides, we must talk about conflict management and not conflict resolution. Political change in Israel is very unlikely in the coming years. Sharon may fall; he may last his full term, but after Sharon will come Netanyahu. The Israeli Labour led left opposition will not come back to power unless there are political changes on the Palestinian side that will create a catalyst for renewed hopes of peace. The Palestinian leadership is very unlikely to change as long as Arafat is able to function or as long as he is alive. For one, the Mitchell Committeereport could provide some kind of "ladder" for the sides to step down a bit. The general fairness of the report as viewed by both sides is its greatest advantage - unlike the Egyptian-Jordanian initiative that is viewed by Israel as being pro-Palestinian. So one focus for activities might be how to translate the Mitchell Committee report into policies. Here the main obstacle is Israelís refusal to accept a full settlement freeze. Sharonís government is built on the support of the extreme right wing with strong settler support. Nonetheless, international efforts must be placed firmly in this direction. Secondly, it should be clear, as I have stated in the past, without real international involvement and engagement, particularly of the United States, there will be no progress at all. It is advantageous for the United States to get fully engaged now rather than later when it will be forced to be engaged as a result of wider regional crises. I have been very cautious until now in not talking about regional spillovers of the intifada, however the riot of last Friday, May 11, 2001, in Amman and the swift and strong use of force by the Jordanian police against the rioters is perhaps the first real sign that the spillovers are inevitable. In my view, the situation in Jordan is very precarious and the future of Jordanian-Hashemite stability should not be presumed as a given. Continued deterioration on the Israeli-Palestinian front will inevitably bring about an error of the kind of proportions we have not yet seen - the kind of mistake such as the killing of 100 Palestinian refugees in Kafr Qana in Lebanon during "Grapes of Wrath". Such an error could bring about massive riots in Amman, particularly from the refugee camps. While the camps in Amman are unarmed, they are controlled by alliances of Fatah Tanzim and Hamas forces that could easily mobilize the public. I would not expect the kind of events of September 1970; rather Amman could look like Belgrade in the final days of Milosovitch. In that scenario, rather than fight, it is possible that King Abdallah II and his family would be on the first flight out to London. Needless to say, a Palestinian-Islamic forces type regime in Jordan would open an entirely different eastern front for Israel. At that point, US engagement would be substantively different and the possible outcomes much more limited. There are also numerous possibilities for the eruption of Israelís northern borders with Lebanon and Syria. There is also a real need to address, perhaps for the first time, the critical linkage between democracy and peace. Almost all of the international efforts aimed at programs in democracy and good governance in Palestine have been money wasted. Peace making and peace building cannot solely be based on top-down programs. You canít make peace with an authority; you can make peace with a people. Yet, Israelis, Europeans and Americans alike have joined hands in support of the Palestinian Authority in the belief that there has been no alternative to Arafat and his self-created Authority. Israelis, Europeans, Americans and the PA itself have feared that real Palestinian democracy could produce the opposite result of what was desired, meaning the empowerment of an anti-peace opposition (what I called above the Algeria syndrome). Such a possibility does in fact exist, particularly when the PA is perceived by so many Palestinians to be unworthy of governing. It must be said that not only the Israelis, the European and the Americans have feared real Palestinian democracy. The Arab regimes in the region have perhaps feared it even more and although no one of the Arab leaders particularly has any positive feelings towards Arafat, his survival has been viewed as more favorable to them than any other alternative. Nonetheless, I have always believed and continue to do so that real Palestinian democracy will in the end not only be good for Palestine, it will be good for Israel as well. The will of the Palestinian people must be put into power and democracy will eventually be the basis of lasting and stable peace in the region. The winds of change are blowing through Palestine launched by a small crowd of Palestinian intellectuals. This is a very positive development and should be encouraged and strengthened in every way possible. Currently one such initiative involves the signing of a petition aimed at encouraging internal Palestinian reforms and democracy. There are other such efforts as well. Perhaps it will be one of the few hopeful outcomes of the intifada. Israel must also address its own democracy and the rights of its Palestinian citizens. The intensity of the uprising within Israel shocked almost everyone concerned. It signaled a breaking point in the relations between the Palestinian citizens of Israel and the State of Israel. There is no doubt in my mind that Barakís refusal to see them as real partners in his government is one of the sparks that lit the flame. The treatment of the Israeli Police and the use of live ammunition and brutal force brought home to every single Israeli Palestinian that they are not really full citizens of the State in the eyes of the State. The refusal of Minister Shlomo Ben Ami to take any direct responsibility as Minister in charge of the police for what happened continues to amaze me and place huge question marks on the intellectual integrity of the Professor of History who became a politician. to be truly inclusive with regard to the Palestinian citizens of Israel. to address the need of this national minority to have much more autonomy in determining its own cultural and educational needs. to find the true means to create a democratic Israel that can allow for the expression of its Jewish character without feeling threatened by the equal rights of the Palestinian minority to express its own Palestinian Arab character. to fully integrate the Palestinian Israelis into Israeli political and social life. They must be included in government. The State of Israel must take real actions to equalize development and opportunities for Palestinian Israelis. The State of Israel must reallocate vacant lands to Palestinian Israeli towns and village to meet the needs of growth and development. The more the State of Israel relates in a truly democratic manner to all of its citizens, the more those citizens will feel that they are truly citizens of the State. We have now retreated 10 years in the peace process. The situation today is much worse than it was at the beginning of the first intifada when IPCRI was founded in 1988. That was a period of great hope for a better future. Today we are living in the trauma of the kind felt in the post 1948 era. Palestinian-Israeli trust is at a new low and hopes for peace in the region are far beyond our wildest dreams. Someone once put it: The future ainít what it used to be. Palestinian-Israeli people-to-people efforts have almost come to a total halt, with small exceptions such as the work being done by IPCRI, the ECF, Givat Haviva and others. This is a tragic loss to the entire region. We must not allow this work to cease. The international community must be encouraged to continue its support for these efforts. The energies must be directed at long-term investments, not one-shot projects that have no built-in continuation possibilities. Palestinian and Israeli NGOís must be encouraged to continue and to expand their work in assuring that peace will grow from the bottom up. Palestinians who are engaged in such activities must be strengthened against the general trend to view these activities today with great disfavor. These are courageous people who need support - financial, intellectual and spiritual. Individuals, institutions, and governments world-wide are called to play an active role in supporting Palestinian-Israeli people-to-people activities. While it is difficult to be hopeful today, we must not give up the hope. One day this region will return to its senses and sanity will rein in the public sphere. There is only one way to bring about peace - and that is through negotiations. As I have stated before, the parameters of a peace agreement have not changed nor are they likely to change. The recognition and the implementation of a two-state solution on the basis of the June 4, 1967 borders is the "blue print" for any peace agreement. It is essential to also recognize that real peace will only emerge if the two States - Israel and Palestine - will work together, cooperate and support each other. The current conflict is likely to push Israeli and Palestinian thinking away from models of future cooperation. This would be a fatal mistake for peace. Even today as the battle wages on, Israeli and Palestinian public figures recognize that they will eventually return to the table to negotiate. It is time to begin to encourage those public figures to say so out loud and not only in closed meetings. Much work is ahead of us to rebuild the trust and confidence that has been so horribly damaged. This must begin now with small steps. Small steps can be made by public figures and they can also be made by ordinary people, who know, deep in their heart, like me, that eventually we will have peace. * Credit for the original name of this piece "WWW - What Went Wrong" goes to Prof. Edy Kaufman of the Truman Institute of the Hebrew University. ..... Die israelischen Friedenskräfte haben ihre AktivistInen in den letzten beiden Monaten deutlich verstärkt. stellen wir im folgenden fünf Gruppen und ihre Aktivitäten vor. und Menschen die Möglichkeit geben, sich jenseits ethnischer Zugehörigkeit zu bewegen. aus israelischen Siedlungen in den palästinensischen Gebieten auf. Arbeit, zur Schule und zum Einkauf zu gehen, oder wenn sie nach Hause zurück kehren. palästinensische Zivilbevölkerung physisch oder verbal anzugreifen. Hussein Agha, Robert Malley, "A Reply to Ehud Barak", New York Review of Books 49,10:4649, June 13, 2002. Camp David and After - Continued, The New York Review of Books, 49, 11:47-49, June27, 2002. Reply by Hussein Agha, Robert Malley. An Interview with Shlomo Ben-Ami, October 31, 2001.